Philip Dunn’s photography work in magazines and newspapers has encompassed almost every genre of photography imaginable. His career as a photojournalist has led to assignments all over the world. Philip’s career began on a local newspaper brewing tea. His talent was soon recognised by Fleet Street and he became the youngest photographer ever to join the staff of the Daily Express. This all resulted in the best job in the world – working for The Sunday Times covering features and travel. Eventually he freelanced for all the top magazines in Britain and many overseas. 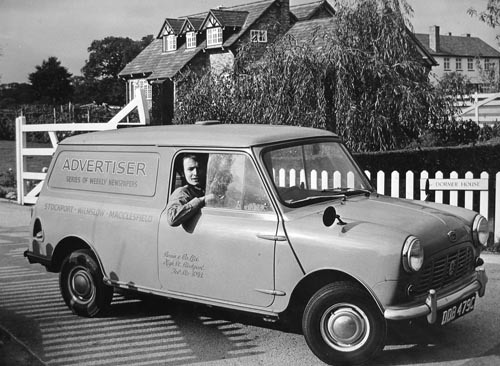 That’s Philip driving the Stockport Advertiser mini van at the age of 17. The picture was taken outside a posh house in Cheshire for effect. 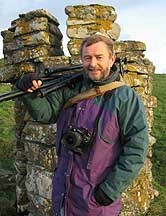 Philip Dunn’s photography work list has covered almost every top newspaper and magazine in Britain and many others overseas. Philip’s first published photograph was in the Manchester Evening News when he was just 14 years old. First of all, at the age of 15, Philip Dunn got a job printing the photo-sales and brewing tea on a local newspaper. As a result of this, one year later he started an apprentice photographer working on a another local newspaper. He then worked for picture agencies and freelanced until, at the age of just 22, he became the youngest man ever to be invited to join the staff of The Daily Express, where, for fifteen years, he covered major hard news stories and features, including the ‘Troubles’ in Northern Ireland. He left the Express to go freelance again before working for The Sunday Times covering human interest features and travel. Philip Dunn has won many top professional awards including both News and Feature sections of the British Press Photographer of the Year Awards. Read how one photograph in particular inspired Philip to aim for a job in Fleet Street. Philip Dunn’s work list of clients is, to say the least, extensive – all these clients have commissioned him on assignments. Countless other newspapers, magazines and books have published Philip’s pictures and words, and he has published three books on photography. Philip Dunn’s photography work list of assignments covers everything from Royal weddings to pregnant gorillas and ranting politicians; Arthur Scargill and the miners’ strike to HM The Queen and Freddie Mercury and Queen. Football finals to the Troubles in Northern Ireland. In addition, he has photographed everything from major air disasters to Fijian cannibals and the coconut dancers of Bacup. His international assignment have taken him to an elephant orphanage in Sri Lanka, the red light districts of Amsterdam,and an igloo north of the Arctic Circle. This vast photographic and journalistic experience is especially relevant when coaching photographers both on a one-to-one and a group level – and it has led to the ability not to take himself too seriously. A large part of the Philip Dunn Collection of vintage images – mostly taken for The Sunday Times – is now handled by the Mary Evans Picture Library in London. When choosing a photography course, always ask about the tutor. Find out just what they have done and who they have worked for – it’s real professional experience that matters most – and the ability to teach, of course.